Denny Hamlin finished in 10th place in Saturday night’s Quaker State 400, the first-ever Sprint Cup Series race at Kentucky Speedway. Hamlin guided the #11 FedEx Ground Toyota to the top-10 finish despite starting in the back of the field by rule after an engine change in the first practice session. Hamlin’s Joe Gibbs Racing teammate Kyle Busch took home the checkered flag to go along with his Truck Series win on Friday. Teammate Joey Logano finished the day in 14th place. By lap 30 Hamlin had maneuvered up the field to 26th place when the first caution flag of the day came out. Crew Chief Mike Ford brought the #11 FedEx car into the pits for right side tires and fuel as well as a wedge adjustment on the right rear tire. Hamlin continued his climb, working up to 14th place, before being called to pit lane on lap 80 during green flag racing. The FedEx team quickly added four fresh tires, a splash of fuel and made a second wedge adjustment. Following the stop, Hamlin went on a tear to claim 6th place before another green flag pit stop on lap 129 for four tires and fuel. The second caution flag of the day came on lap 139, and Mike Ford brought the #11 FedEx car back in to pit for four tires and fuel. Having experienced some handling issues, Hamlin was in 17th place when the green flag brought the field back to speed with 121 laps remaining. On lap 193 Hamlin grabbed the lead as many of the top 15 drivers pitted under green flag racing. Ford’s decision to pit on the prior caution allowed the FedEx car to stay out as others pulled down pit lane. Hamlin led for five laps, gaining valuable bonus points, before he was forced to pit on lap 199 for fuel and new tires. With 67 laps remaining, Hamlin cycled out in 10th place, with only 12 cars left on the lead lap. Hamlin continued to fight his way up the field, reaching as high as fifth place, before needing to pit for fuel and right side tires with 16 laps remaining. With the result, the FedEx team moves up one position in the Chase for the Sprint Cup standings to 10th place. 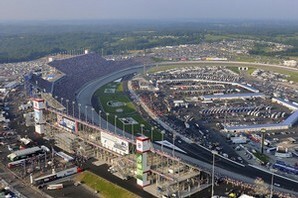 The Sprint Cup Series resumes Sunday, July 17 in Loudon, NH for the Lennox Industrial Tools 301.